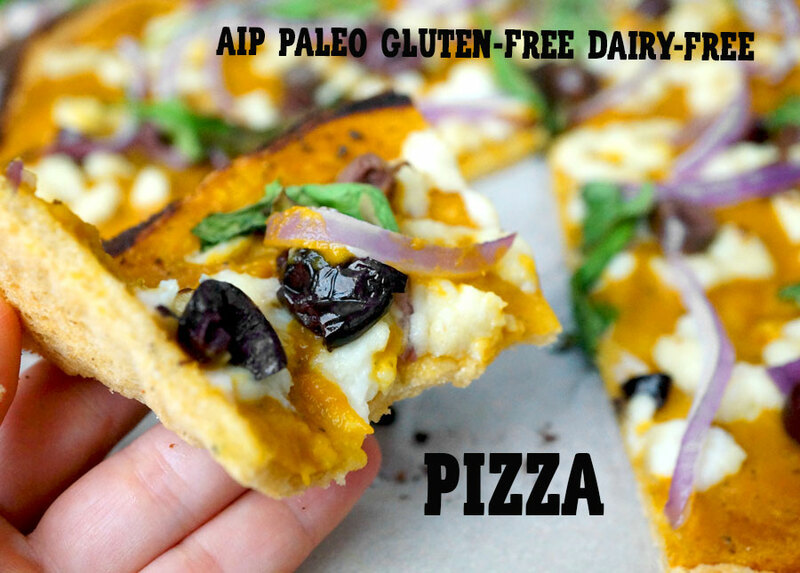 AIP Pizza – free of grains, dairy & nightshades! 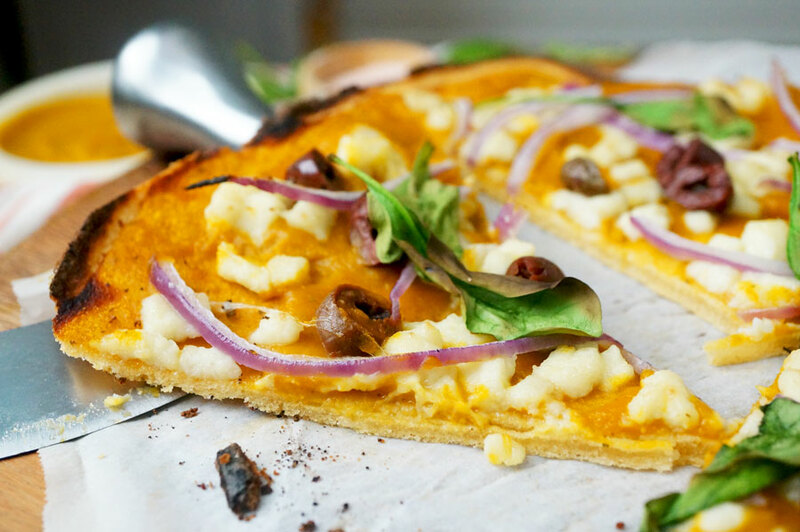 AIP Pizza made with chewy, foldable crust, nightshade-free sauce & dairy-free cheese! Pizza is a hot button issue for me. After going gluten-free 6 years ago after a girl’s trip to NYC where I dove throat-first into many-a-slice-a-pizza-pie, I still mis it terribly! Pizza is my favorite food… and many of my fellow AIPers favorite food. I’m here to help fulfill your AIP Pizza dreams in anyway I can. I’ve made Pesto Chicken Pizza, Garlic Lovers Spinach Pizza, Ham & Pineapple Pizza & Prosciutto and Fig Bistro Pizza for The Healing Kitchen. I’ve made Smoked Salmon Flatbread, Caramelized Onion & “Ricotta” Pizza and Meat Sauce Pizza for Enthused! Right now if you look at the homepage of my website, it’s half pizza recipes. Living life over here. What I hadn’t yet made is your traditional thin crust, bendy, foldable, drunk college style, tomato-y, cheesy pie… um without gluten, dairy, nightshades or eggs. It kind of freaks me out to even put a recipe on the Internet for pizza that doesn’t include A SINGLE component of true NY-Style pizza. But hey – there’s millions and millions of people in America with autoimmune disease. And we can’t all eat gluten, dairy & nightshades! Let’s be real – most gluten-free crusts leave a lot to be desired – they’re flavorless, crunchy and ruin the whole pizza experience. This crust however is based very closely on my original thin crust that you guys love so much! I’ve just added gelatin to make it more bendable but it still holds up GREAT! The toppings, in my humble but accurate opinion, are necessary. Having just the “cheese” and “sauce” wasn’t enough to give me a full-on pizza vibe but adding the sliced kalamata olives, spinach and red onion took it to that level. Yes. That was easy. No you can’t use cassava. Nothing replaces coconut flour. No you can’t use ground unicorn balls. CAN I USE MY OWN SAUCE? Of course! You can use any homemade sauce but make sure it tastes closer to tomato sauce than not! In fact, make this recipe super easy by using KC Naturals Nomato Sauce instead of the one in the recipe! WAH. WHY ISN’T THE SAUCE RED? Because I used carrots instead of tomatoes combined with some other tasty ingredients. If you want red sauce, add no more than 1/4 cup chopped red beets in step 1. It’ll change the flavor slightly but you should get your redder sauce. CAN I REPLACE THIS WITH THAT? Yes you can replace the pumpkin with either butternut squash puree or sweet potato puree (for a sweeter sauce). Yes you can use whatever dried Italian herbs you have on hand – basil, oregano, thyme, marjoram. I just didn’t want to go crazy on the number of ingredients since it’s a 3-part recipe. Yes you can use 1 teaspoon apple cider vinegar in place of the cream of tartar. Yes you can leave out the probiotic but it helps give it a cheesy flavor. Not all probiotics will be acceptable here – just the one in my recipe because it is yeast based. (See nutritional yeast suggestion below). Yes you can add 1 tablespoon nutritional yeast to the cheese. I personally don’t tolerate it, so that’s why I used this probiotic. No you cannot replace the coconut flour with anything else. It is very absorbent and needed in this crust recipe. No I don’t know how to make this low FODMAP. And I DEFINITELY don’t know how to make this low carb. CAN I DOUBLE OR TRIPLE THIS RECIPE FOR MORE THAN 2 PEOPLE? Yes you can double & triple this recipe for a pizza night! You can either double the crust & cheese recipe and make 1 large pie (still rolled out just as thin) OR you can make 2 separate regular-size pies. If you follow the recipe as written, NO need to double the sauce recipe. There’s enough for 2 pizzas. You will have to double the crust & cheese though! CAN I MAKE AHEAD EACH COMPONENT? Yes you can make this ahead. You can make the crust ahead, pre-bake it & freeze it. You can make the sauce ahead of time and store it in the fridge. Same with the cheese (store in fridge, not freezer). Okay, guys! Get your pizza on – get creative if you want to switch up the toppings. Make it your own! Use this recipe as a base for your AIP pizza dreams & let me know what you do! + yes it’s a bit of a time-consuming pizza (that’s what happens when you even have to make your own cheese!) but just make it a fun family or weeknight activity! 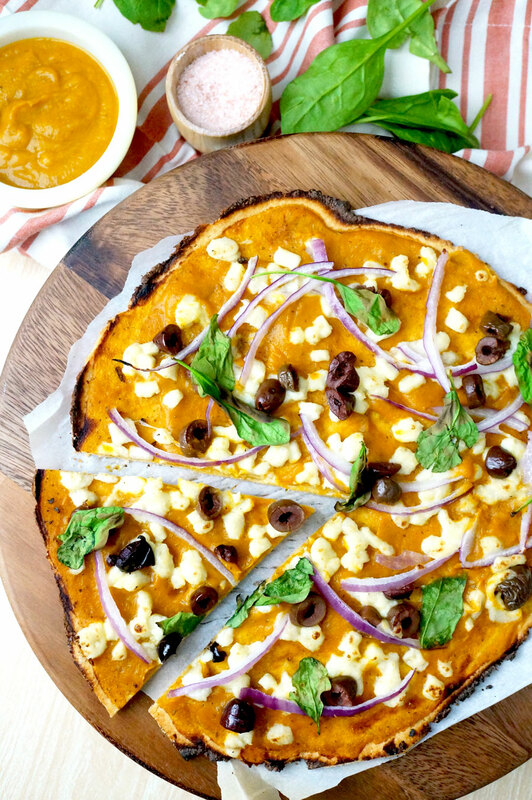 AIP Pizza - free of grains, dairy & nightshades! Steam or microwave cauliflower florets until very soft (about 4 minutes in the microwave). While cauliflower is hot (this is important), add it to a food processor with the remaining ingredients. Puree. Transfer mixture to a small parchment lined plate. Spread with a rubber spatula to above ¼-inch thickness. Place in freezer to set quickly (about 20 minutes) until firm enough to cut. Using a non-serrated knife, slice “cheese” into very small pieces (no larger than 1/4-inch) about the size of peas. Set aside while you make the crust. In a medium saucepan, heat 1 tablespoon olive oil over medium heat. Saute carrots, onion and garlic with herbs and sea salt for 5 minutes until softened. Pour in water and bring to boil. Cook for 5 minutes uncovered. Stir in pumpkin, maple syrup and balsamic. Cover with a lid and maintain a low boil for 5 more minutes until the carrots are very soft. The sauce will have reduced in size by about half. Transfer to a blender and blend on high until very smooth. The consistency should be as thin as traditional tomato sauce but thick enough to stick to the spoon. If too thin, you may transfer pureed sauce back to pan and simmer for a few minutes to reduce. Stir in remaining olive oil and set aside. Preheat oven to 425 degrees. Line a pizza pan or baking sheet with parchment paper. Mix all dry ingredients (except gelatin) together in a bowl until well combined. Stir in olive oil. In a separate bowl, whisk together gelatin and hot water until frothy then immediately stir into dry mixture until a ball of dough forms. Transfer dough to parchment paper lined pan or sheet. Place another sheet of parchment paper on top and use a rolling pin to roll the dough into a very thin circular pizza crust about 1/8-inch thick. Bake for 10 to 11 minutes until lightly golden brown. Preheat broiler to high. Arrange oven rack 6 inches away from top broiler element. Remove parchment paper from bottom of crust. Spoon half of the sauce (or desired amount) on pizza crust, smoothing to 1/2-inch away from the edges. Sprinkle evenly with cheese. Top with sliced red onion, kalamata and spinach. Broil pizza for about 2 minutes, keeping a very close eye on it, so the edges do not burn! Sprinkle with fresh basil, slice and serve. 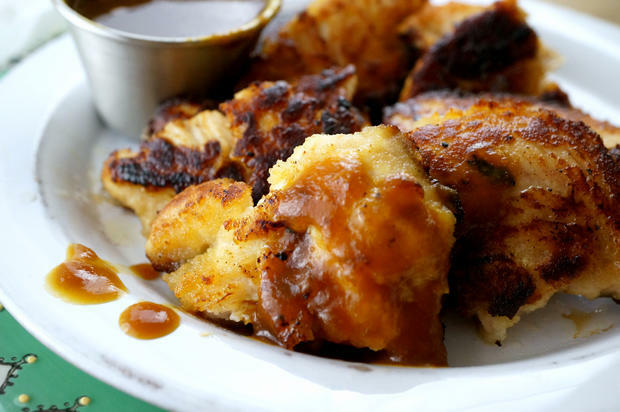 Twice in this excellent-sounding recipe, you say “maple”… Is that maple syrup or maple sugar? I can’t tolerate tapioca starch what can I replace it with please … looks 😋!! In the blog post, I mention you can use arrowroot 🙂 Enjoy! I do not! But you could submit all the ingredients to Cronometer as a recipe and divide it by 2 or 4. It’s not a low carb recipe but the cheese and sauce is quite marginal in calories. I can’t find a good quality balsamic vinegar without the nasty additives in my country. Can I sub it with something else? If you’d like to use white wine vinegar or apple cider vinegar that is fine as well. Have you heard of Thrive? That’s a great place to shop for discounted healthy pantry staples. You can get 20% off your first 3 orders using think link here! Sounds delicious! I know you said nothing can replace coconut flour but do you think tigernut flour might work? One question….in the pizza crust ingredients, it refers to ‘warm water’ and in the recipe it refers to ‘hot water’….I’m assuming this is the same thing, right? I just made this recipe and you are GENIUS! So yummy! I’m a native New Yorker and never thought I’d eat pizza again but thanks to you I can. I’m dying to try their’s in the recipe to make it easier! What a high compliment from a native NYers – thank you! Would I still get the chesse flavor if I don’t use the probiotics? Wanting to make tomorrow and didn’t plan enough ahead to order and receive that product in enough time. Not AS cheesy but you could add some garlic or truffle salt to get more umami salty flavor! You could use nutritional yeast but I know a lot of us have sensitivities to it. Does it need to be that specific brand of saccharomyces boulardii or will any brand help give it a cheesy flavor? Will baking the probiotic degrade its potency? Just that type of probiotic! Hi, just curious – why only that type of probiotic? Okay, so here I am minding my own bidness, working on the roundtable and I see “No you can’t use ground unicorn balls.” Did no one else read your post?!? 😆 I may have scared my 5 year old son with the howling laughter that ensued. So, thank you for that. No, really. That was hilarious. HA! Oh man, it may have just been the two of sharing in on that joke. Am I able to use the Florastor S. Boulardii or is the particular brand you link important? Thank you. I was just recently diagnosed with Hashimoto’s and have been so depressed for days because I thought I wouldn’t be able to eat ANYTHING good, and then I came across your blog and I literally almost cried from happiness! 🙂 So excited to try! BEST CRUST EVER!!!! Thank you for posting! I finally had a good pizza on AIP! Wouldn’t the heat of the cauliflower kill the probiotics if you add them while it’s still hot? I’ve read dead probiotics still help the body, but obviously alive would be preferable! The purpose of these probiotics isn’t for the actual probiotic content but for the cheesy flavor yeast based probiotics give food – I can’t eat nutritional yeast along with many others so this is an alternative! You’re doing great! Hmmm, I’m not sure how pectin would perform here. It COULD certainly work – I know people sometimes use agar agar to replace gelatin too. Just made this crust, it is so yummy! Thank you so much! I would definitely choose pumpkin over sweet potato! I came to this site for the recipe. I stayed because of the unicorn balls. I was wondering if there was a way to replace starches in the pizza sauce? I cannot tolerate any kind of starch, so for me everything from tapioca to arrowroot to cassava is unusable. Thank you so much! I really want to try this!! !